After la Fête dans la Ville in Amiens, Viva Cité in Sotteville-lès-Rouen and Le FAR du Pays de Morlaix and Les Journées Européennes du Patrimoine in Loos-en-Gohelle, Luc Amoros company’s monumental creation « Page Blanche » gets ready to illuminate la Place de la Liberté in Brest. 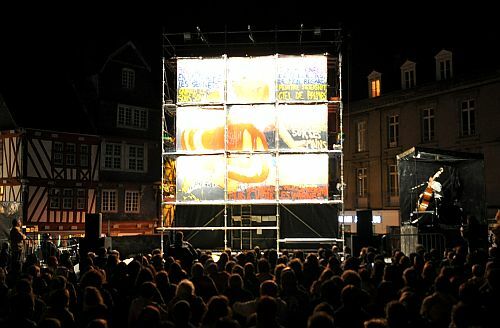 On Thursday 7th October 2010, the National Centre for Street Arts le Fourneau welcomes the art company for a performance in the heart of the City as part of La Déambule, event organised in partnership with the City of Brest and Brest Métropole Océane. This event is also the opportunity for le Fourneau to invite to Brest 20 students from the Winchester University as part of a ZEPA partnership between this British university, Hat Fair Festival and the « master 2 Management du Spectacle Vivant » of the Université de Bretagne Occidentale (equivalent of Master in Performing Arts). More information on Le Fourneau’s website.